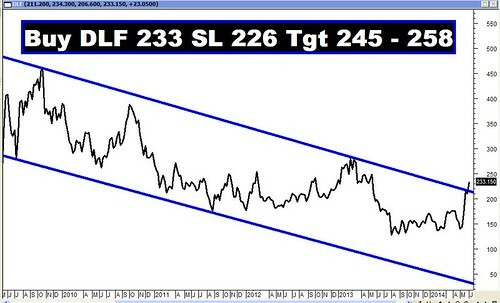 Archives : BULLISH BREAKOUT TO TRADING RANGE - 06/06/2014. BULLISH BREAKOUT TO TRADING RANGE – 06/06/2014. It was a record breaking week at Dalal Street as the market went from strength to strength to post an amazing weekly gain of over 1100 points on the Sensex and in the process managed to conquer the level of 25000. The rally this week was initially led by the Banking and Financial sector when the RBI cut SLR by 50 bps and later in the week, the Oil and Gas sector rallied to push the indices higher and close above the top of the Election day Trading Range (Sensex 23873-25375 and Nifty 7130-7563). Oil and Gas sector is the one sector which normally bears the brunt of subsidy sharing and now there is renewed hope that the current Government might spare this sector to a certain extent by taking tough policy decisions. Sensex opened the week at 24368, made a high of 25419, low of 24270 and closed the week at 25396. Thus it closed the week with a strong gain of 1179 points. At the same time the Nifty opened the week at 7264, made a high of 7592, low of 7239 and closed the week at 7583. Thus the Nifty closed the week with a gain of 354 points. Both Sensex and Nifty formed a big White body Marubuzo on the weekly charts such that they completely negated the Bearish Engulfing pattern formed last week. On the daily charts both the indices have formed a big white body candle with a bullish gap. Thus both daily and weekly candlestick analysis suggests bullishness in the near term. 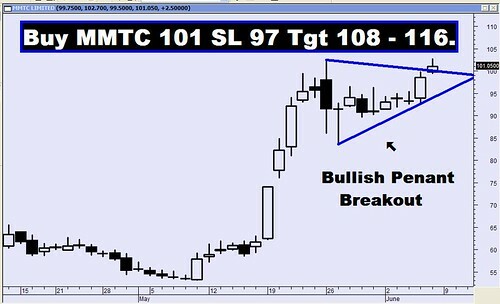 Both the indices have completed a Bullish Flag pattern on daily as well as weekly charts. Thus as per Flag pattern on daily as well as weekly charts, one can expect a target of 25859-25915 for the Sensex and 7705-7706 for the Nifty. For the last three weeks the market has been consolidating inside the Election Day candle (Sensex 23873-25375 and Nifty 7130-7563), which got taken out on Friday when both the indices closed above the higher end of the Trading range. As a result of which Sensex is now headed towards a target of 26187-26587 and Nifty towards 7890-8008. On Friday, both the indices once again formed a Bullish Rising Gap between Sensex 25129-25044 and Nifty 7497-7484. This gap will not only act as an immediate support but it is also a Measuring Gap. Hence as per Gap theory, the target falls at Sensex 26010 and Nifty 7863. If the above mentioned Support of Bullish Rising Gap between Sensex 25129-25044 and Nifty 7497-7484 is breached then the market will proceed to test an intermediate bottom at Sensex 24644 and Nifty 7360, which is likely to provide strong support. Market has left behind a stronger Bullish Rising Gap between Sensex 23729-23572 and Nifty 7067-7020, which will act as stronger support zone. Hence the current uptrend will reverse only if this support zone gets breached. When the market overcame the previous top and made fresh lifetime highs, it marked the end of six year consolidation. On the weekly charts both Sensex and Nifty have completed a Bullish Saucer formation and the targets as per that will fall at Sensex 27081 and Nifty 8145. The targets are likely to be achieved within a period of next 20 months. Both Sensex and Nifty are way above the short term average of 20dma (Sensex – 24420 and Nifty – 7285), the medium term average of 50dma (Sensex – 23256 and Nifty – 6947) and the long term average of 200dma (Sensex – 21176 and Nifty – 6300). Thus the trend in the short term, medium term and the long term timeframe continues to remain bullish. MACD and ROC are positive and continue with their Buy signals. RSI and Stochastic Oscillator continue to remain overbought. OBV and MFI continue with their Buy signal and so do the Directional Indicators and the Bollinger Band. ADX is at a high level of 50 which suggests that the strength of the current uptrend is very high but the trend is now maturing. Hence it is suggested to be cautious as some consolidation in the current uptrend can be expected. Nifty Options data suggest strong Put writing at the strike of 7500 and strong Call writing at the strike of 7800. Thus one can expect a range of the market between Nifty 7500 and 7800. For the week ahead, Sensex will find Support at 25019-24644-24163 and will find Resistance at 25800-26187-26587. For the week ahead, Nifty will find Support at 7474-7360-7229 and will find Resistance at 7705-7838-7974.